As a blogging associate director of a faith-based non profit, geared towards community and its progress. We would not be in good standing without our Creator and community partners. Mel's Fish a tasty community partner, who goes over and beyond every time we place an order for our youth football camp and dinner for the family. 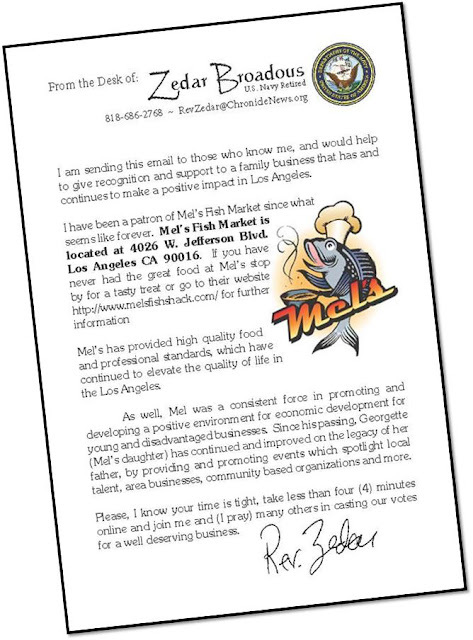 Mel's Fish is located at 4026 West Jefferson Blvd in Los Angeles, its one of the better fish markets in the city. In the 70s African Americans owned all in fish markets in Los Angeles, today Mel's Fish Market is an example and legacy of community, business, family and one of the last family-owned fish markets; reason why they are so special to us. Every Thursday is about those exemplifying leadership and being totally disruptive for their community. Mel's Fish a landmark seafood eatery here in Los Angeles. A business with excellent food and service. Support the locals and keep your money circulating 20 times around the hood before it leaves the community and next Thursday it may be you! Note: This is not a paid advertisement, it's valued appreciation for Mel's Fish Market.